CitadelSix Custom Design is planning to have a trade stand in 2020. This will allow time for Sue, the new owner, to become better acquainted with the business and products, before tackling events and shows. Photos of last year’s AMBUSH! show, held at the Driffield Show Grounds in East Yorkshire on June 23 & 24, will be posted up soon. 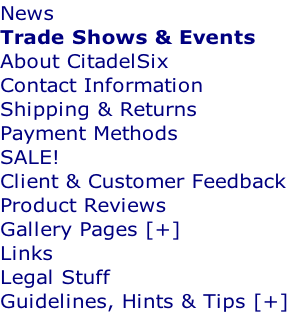 Well now, one thing became very clear - a 6ft space is no longer big enough to display all CitadelSix’s products! Even with the addition of a 6ft X 2ft Gridwall display stand, I still couldn’t show the full range of Wars of the Roses sets and none at all of the Scottish Wars of Edward I - III sets. As ever, it was good to see some familiar faces among the visitors to the stand, as well as making some new friends. And of course, being right next to Sgt’s Mess is great fun, as Garry can always be counted on to ‘fill’ the quieter moments and lulls in trading with his entertaining banter and endless supply of anecdotes. 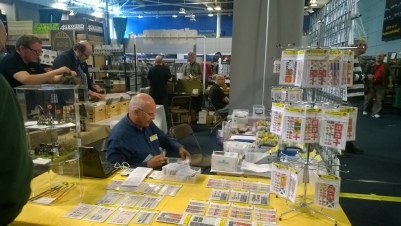 The event also provided a good opportunity to meet some new miniature manufacturers with an interest in CitadelSix supplying custom decals exclusive to them. Hard to believe that a whole year has passed so quickly since the first ever appearance of CitadelSix Custom Design at the Colours show in 2012. 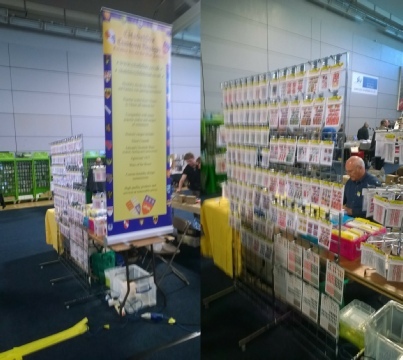 Comparing the stand with last year’s set-up, things have definitely progressed steadily and increasingly well with each gaming event and show we’ve attended. The latest addition to the stand of the display case, even with just a few miniatures - featuring some decals from the 15mm Knights Crusader, Hospitaller & Templar, 28mm Wars of the Roses Livery Badges and Banners & Standards, and Fantasy ranges, plus four cut-down Longbow Arrows with Crested Arrow Wraps - attracted a fair amount of interest from the paying public and traders alike. The ever-expanding 28mm Wars of the Roses decal-sets range brought in a good deal of sales, including the four new Banners & Standards sets that were released for the show. 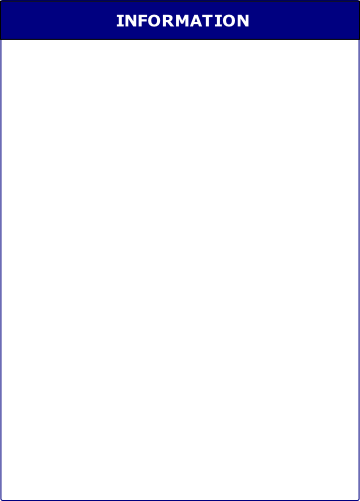 In general, our overall product sales for the weekend were well over four times those of Colours 2012. We also had a far larger number of repeat customers than at previous shows we’ve attended since Colours 2012. So our reputation and the word is definitely spreading. 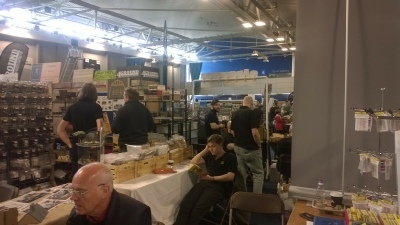 As always, it was good to see a growing number of familiar faces among the visitors to our stand, as well as to meet and make more acquaintances from our neighbouring traders: Douglas & Merion from Dark Realm Miniatures, and Christine & Co from Empress Miniatures. 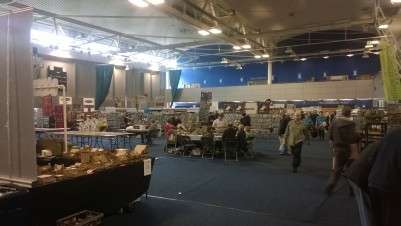 Had a pleasant time at the Milton Keynes Wargames Society’s two-day show in the grand surroundings of the Middleton Hall shopping centre (consequently, I didn’t see much of my glamorous assistant, as there were too many retail opportunities to lure her away!). It was a little disappointing from a trading point of view, but I made some more new acquaintances: Ray from the Sealed Knot; the folks from the Peterborough Wargames Club with their absolutely wonderful and innovative participation game (great fun! 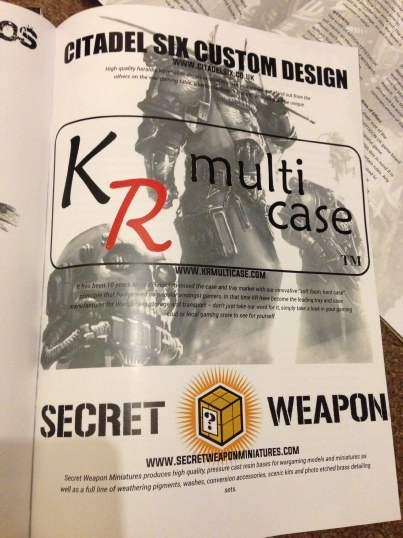 ); and the folks from Wargames Workshop and SHQ Miniatures. It was also good to see some familiar faces again among the visitors to the stand. CitadelSix Custom Design attended the Overlord 2013 event on Sunday, 3rd March 2013 at Fitzharrys School, Abingdon, Oxfordshire OX14 1NP. Some familiar faces again among visitors to our ever-improving stand (enhanced by my ‘glamorous assistant’ Jill, as shown in the photo below). 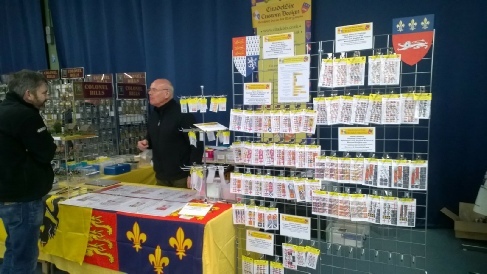 CitadelSix Custom Design had a trade stand at the Call to Arms event at Theale Green Community School in February 2013. It was good to make some new friends (Garry & Ellen of Sgt’s Mess, Shaun from Dreamholme Collectables and Matt from Glenbrook Games and Painting Service), as well as to see some familiar faces among the folks who visited our stand. CitadelSix Custom Design attended its first trade show at Colours 2012 over the weekend of 8/9 September 2012 in the Newbury Racecourse Grandstand (bottom left). The pictures below show me setting up ready for the opening on the Saturday morning (left) and looking a lot more relaxed on the Sunday morning (right) - obviously the coffee did the trick!. Unfortunately, I wasn’t able to attend this event, due to a prior commitment that same weekend. However, I was both pleased and somewhat flattered to be approached by Scott Kelly to supply decal-sets for the gamers’ Welcome Packs. 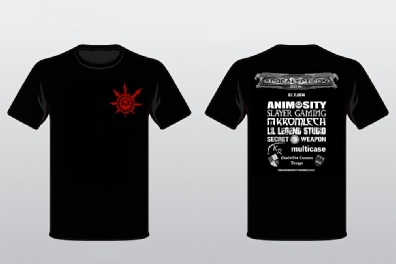 In return, the CitadelSix Custom Design logo was included on the T-shirts and in the printed programme for the event (See photos below, courtesy of Scott Kelly). So, plenty of free publicity. The event was particularly auspicious because it was the first time that an official APOCALYPTICON events was held in the UK! 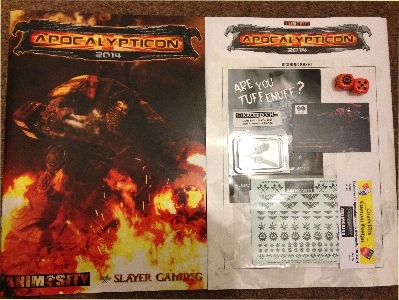 APOCALYPTICON UK is an official extension of the hugely successful annual Apocalypticon games in the US. 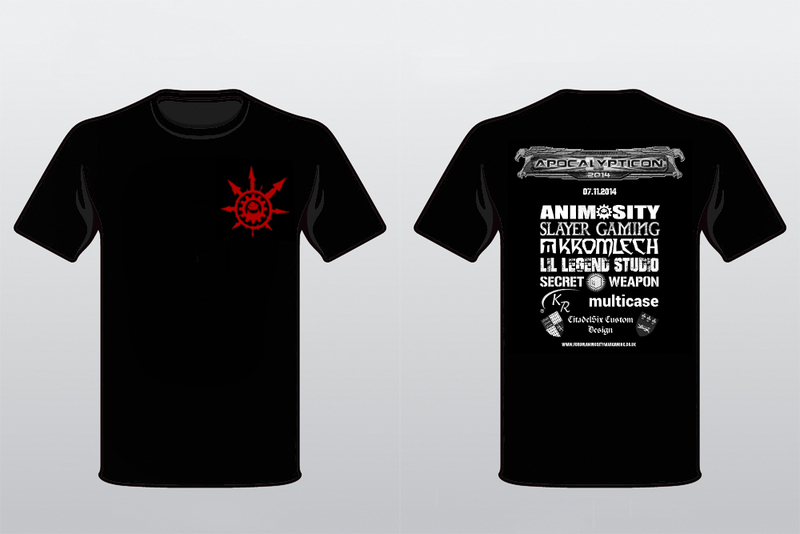 The UK event was brought together and hosted by Miniwargaming.com, along with Animosity, and held at the Slayer Gaming venue in Mansfield, Nottingham. Well, I have to be honest and say that this turned out to be a disappointing show, and certainly seemed to be an opinion shared by other traders there. 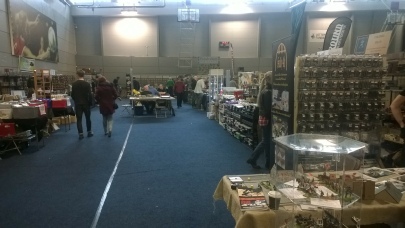 For such a well-known show and in such a huge venue, with well near 120 traders present, the public attendance was very poor (as can be seen from the photos below of the hall inside the EISS building). So, all-in-all, the business made a sizable loss in trading terms, but made some good contacts. It was also good to meet some customers from ‘north of the Wash’ for a change. Amazing! Probably the biggest show I’ve traded at so far, and business-wise, a very successful one, that is if I discount my PayPal account being hacked into … beware of open / public networks when using a PayPal Here device linked to your mobile / smart-phone! Apart from that annoyance, I made some more trader friends, Gary & Alison of Miniaturemen and Paul of Early War Miniatures (thanks for the tea and sympathy, Paul), as well as got to stand within six feet of a hero of mine, none other than Alan Perry! Woah! 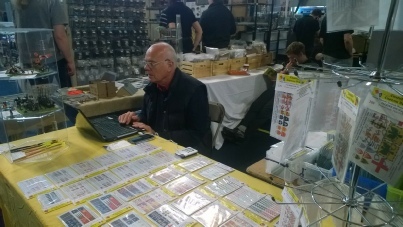 As already mentioned, the show yielded some great new business opportunities, one of which has already developed as a consequence of my being approached by Ian Clunie of Shellhole Scenics. CitadelSix Custom Design is currently designing some flag sets for a new product range that Shellhole Scenics will be launching soon. And, as always, a lot of design commissions are now beginning to stack-up as a result of contacts made at the show. So, a big “thank you!” to Nigel Nicholson for finding me a 12-foot space at this year’s event. Another great show, thanks to Nigel Nicholson, who is sadly now ‘stepping down’ as the event organiser. Daryll, of KR Multicase, is taking over the role from Nigel and came along to introduce himself before the start of the show on the Sunday morning. I wished him ‘good luck!’, as I’m sure all the other traders did. 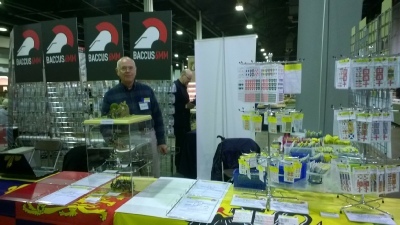 The show proved very successful again for the business, yielding a great opportunity to produce and exclusively supply Early War Miniatures with Tactical Recognition Markings decals for their range of WW2 Italian armour. It was also a chance to meet up again with Gary & Alison of Miniaturemen and Paul Thompson of Early War Miniatures (see photos, below). However, there was no sign of either of the Perry brothers this year. Shame! 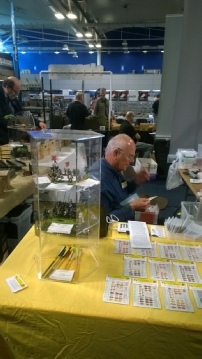 Catching up with Paul Thompson at his Early War Miniatures stand during a quiet spell on Sunday. 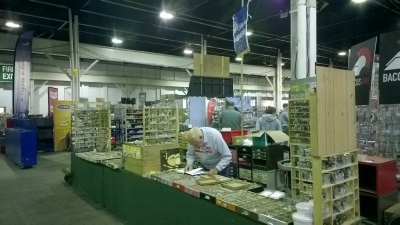 Gary & Alison’s Miniaturemen stand and view of the local ‘avenue’ before opening time on Saturday morning. 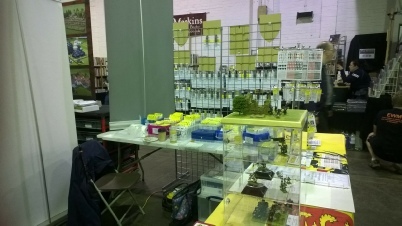 Final preparations and check at the Irregular Miniatures Ltd stand before opening time on Saturday morning. 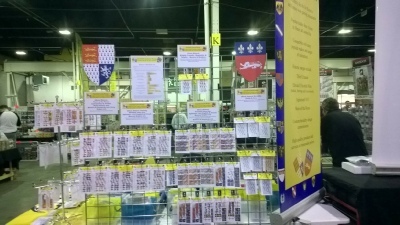 It’s amazing how easy it is to fill a 12-foot trading space with just decal-sets and a few display stands and cases. However, it’s a great deal easier to pack away at the end of the show than it would be if the products were metal and plastic miniatures … And I don’t need anything bigger than my car to transport it all: everything fits neatly into storage boxes in the boot and on the back seat, and the racking goes onto the roof bars. There’s even room in the car for a sack trolley! 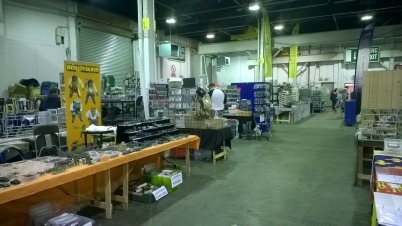 As always, it was good to catch up with Anne of Sally 4th, Lozenzo Pala from Warlord Games, and Gary & Alison of Miniaturemen, who were there as visitors rather than traders, because they weren’t able to book a trade-stand. Pity! And I did look out for the ‘famous names’ who were purported to be at the show, but didn’t see any of them. Maybe they decided to keep a low profile. 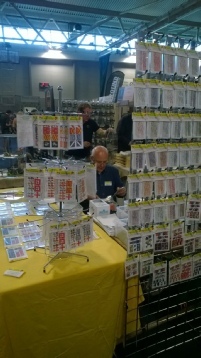 This show, like others previously, proved useful in gaining some more ideas and suggestions for new ranges of decals. So keep an eye on the News page for future announcements. Finally, I should like to acknowledge and thank Jill, my wonderful wife, for all her incredible support and help with preparing for and ‘manning’ the trade stand at this and previous shows. I really couldn’t manage to do it all without her. Having a chat with Scott from Colonel Bills next door.